Sometimes your computer may need to have its IP address renewed. Each computer on the network needs to have a unique address, known as the IP address. 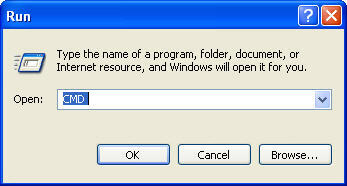 To renew the IP address, go to Start, Run and type CMD to open up a shell. Next, type in ipconfig /renew (make sure to have a space between the two words) to get a new IP address for your computer.